The Liveaboard Takes the Suburbs: A Year of Sewing Blogging and a Giveaway! My "blogiversary" was on Oct. 25, and, in general, I don't usually think too hard about post counts and anniversaries. Lately, however, I've been thinking a lot about how sewing has changed my life in the past year. Mostly without meaning to do so, I've gone an entire year without purchasing clothing. Well, I have purchased exactly two items in the past year: a pair of running shorts over the summer and a silk shell to wear with my suit last January. That, to me, someone who loves clothing, is incredible. Nearly unbelievable. I didn't set out to fulfill a challenge or test myself. I just didn't buy anything. And, to be honest, it was really easy. At the best of times, I don't really love shopping for clothing. I'm taller than the average American woman and I'm pear-shaped, so I have a difficult time finding clothing that fits and flatters me. Most shopping just used to depress me. And an entire month of wearing me-made clothing. A large part of that is due to the amazing online sewing community. Everyone talks about this all the time, but the level of love and support in the sewing community is awe-inspiring. Instagram and Twitter offer tons of encouragement, as do blog comments and my local sewing group on Facebook. Plus, it's always inspiring to get to meet your favorite online bloggers in person. Sewing has made me confident in my body and in my clothing. I have many fewer "fat" days than I used to. If something doesn't fit, I fix it. But mostly, since I'm sewing to my own measurements, my stuff fits. No more "this is a 6, yay!" or "I can only wear an 8 at this store, sad." I mean... how crazy is that? We should all know now that the numbers don't mean anything, but boy is it easy to get sucked into them. I can't be alone here, why else would stores use vanity sizing? Anyway, as a thank you to the general sewing community (and because I've won two sewing giveaways this year!) I'm doing a small giveaway of my own. 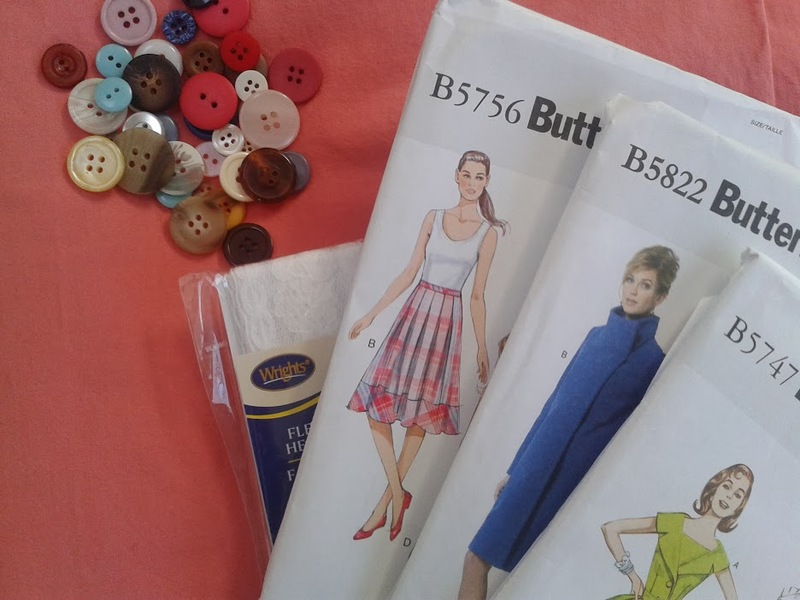 The winner of this giveaway will get 2.5 yards of slightly stretchy coral cotton (pre-washed), three Butterick patterns (a skirt, a coat and a vintage reproduction dress), a package of lace hem tape and a handful of random buttons from my button stash. All you need to do to win is leave a comment on this post by Friday, Nov. 22 at midnight. On Saturday, I'll use a random number generator to choose a winner. One entry per person, please! Good luck! And thanks for being awesome, sewing community! I am the first one to post, yayy!! Happy Blogiversary Aleksandra! You have made some terrific stuff. I can't believe you've already made a lined jacket! I know what you mean about the joy of being part of the sewing community and being able to sew youe own clothes. Its awesome isn't it? Heres to another great sewing filled year! Happy blogiversaryQ And even more so, congrats on building a great wardrobe and not buying anything for a year. I'm really impressed with your Minoru. And I agree, the online sewing community is awesome! Yay! Happy anniversay! You've made a lot of super beautiful things in one year :) It was so much fun meeting all of you in march! Great give away too!